If you’re perusing CatTime, it probably means that you’re at a point in life where people have long ago decided that gifting you cat-themed presents for any holiday and special occasion is the way to go. This is cool, but there are some guidelines you should really consider before going ahead and gifting even the most confirmed feline fancier a stocking full of cat-themed treats and trinkets. Consider this your CATegory-by-CATegory guide to sensible cat-themed gifting. Giving someone a gift that suggests that they might be consuming too much alcohol is bad. Giving someone a gift that encourages them to go ahead and be merry in a light-hearted way is good. Giving someone a gift that uses the cat as an excuse to get tipsy is, obviously, excellent. 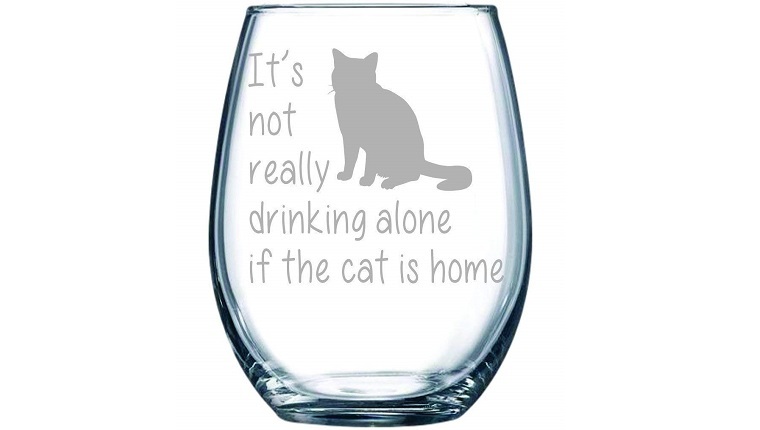 That said, variations on the “It’s not drinking alone if your cat’s home” slogan are always welcomed, especially on a stemless glass. Buy it on Amazon here! There are some slickly-designed cat-centric cups out there, and some are even shaped to resemble cat ears and tails. Let’s be honest, there’s something a little uninspired about gifting someone a coffee mug–unless it features fantastic felines. 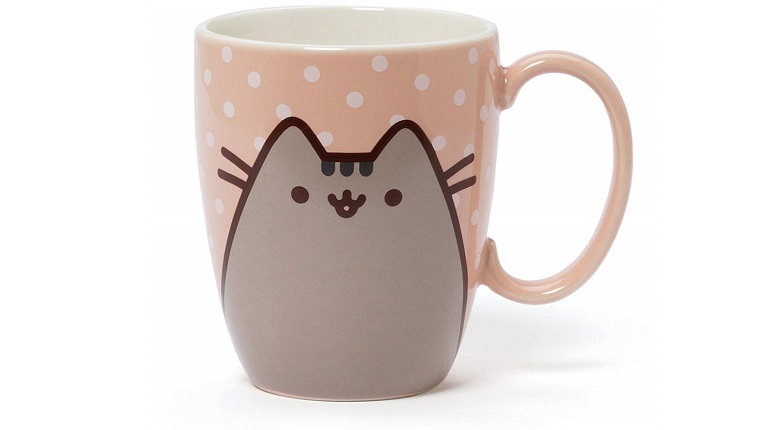 If you are intent on going with this somewhat mundane option, at least pep things up by plumping for Pusheen, the Internet’s favorite animated Domestic Shorthair. Buy it on Amazon here! It’s best to gift your calendars early, if that’s an option, in case the intended recipient has already snapped up one for themselves. Also, as they’re going to be on display in someone’s abode, make sure to try and match the art style and tone with that person’s tastes. 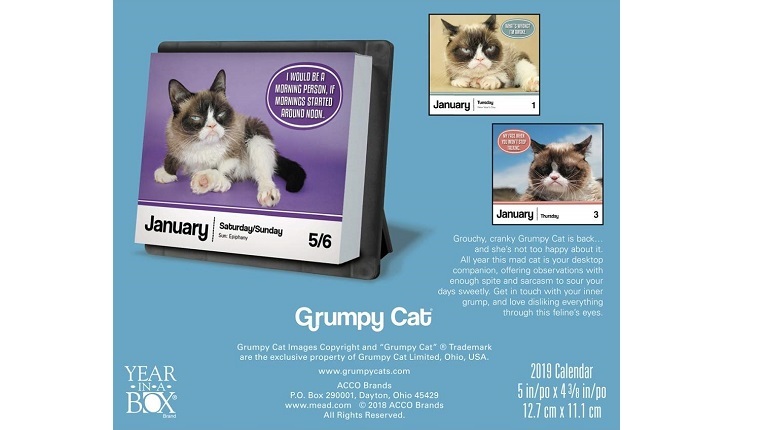 Check out the calendar above featuring internet sensation, Grumpy Cat! If your gift receiver could use some grumpy hilarity to start their day, this is the gift that will keep on giving through 2019. Buy it on Amazon here! Despite their cliched status, socks are actually just about the best gift you can give to anyone. There is nothing quite like the first time you slip on a brand new pair. Adding cats to the mix is obviously cool. Just remember that not everyone can strut around all day during work hours showing off their cat status. 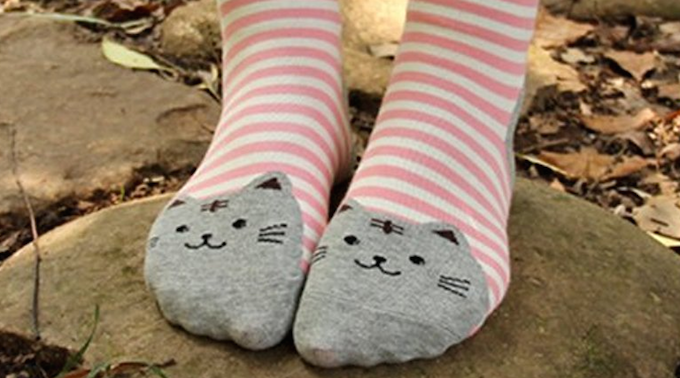 In that case, check out the way AnVei-Nao’s cat socks smartly hide the kitty face down by the toes. Buy them on Amazon here! Sure, by all means go ahead and hand someone a feline-fronted t-shirt. 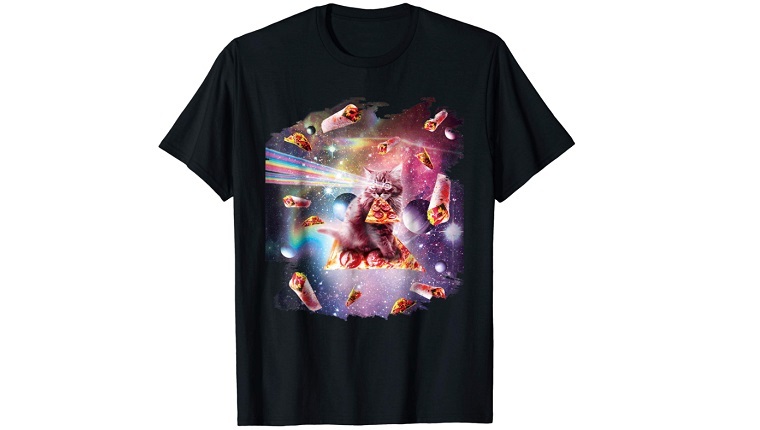 But just remember that if you gift them something from the wackadoo corner of the Internet–say, a tee featuring a cat eating pizza in outer space surrounded by burritos–then there’s a small chance they’re only ever gonna wear it once before it ends up ultimately being repurposed as a dish rag when litter box cleaning duties come around. Subtle and witty is the usually the way to go with cat shirts. But if you have a friend who will dare to be outrageous, this is the shirt to get. Buy it on Amazon here! Honestly, I’d avoid this. Sure, there’s lots of great, modern and even edgy cat illustrations out there–and many even riff on pop culture — but unless you’re 100% certain that your friend, family member or acquaintance definitely likes the style, you’re buying them some frame-able eye candy that they might feel obliged to display at home even if they don’t really like it. The exception? 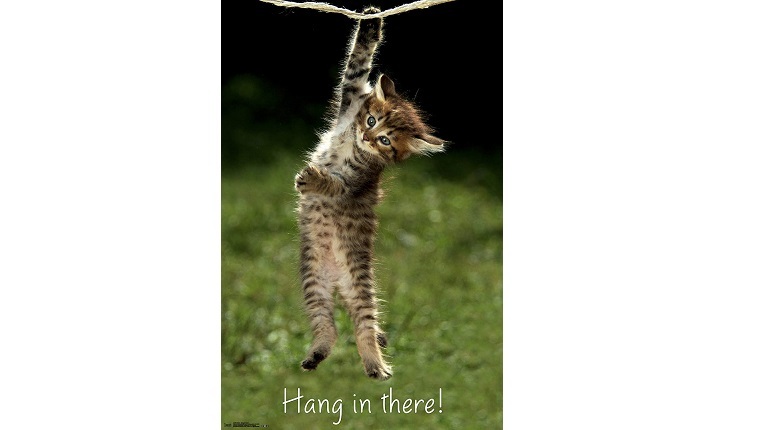 Those Hang In There posters for a secret Santa. They’re pure office classic. Buy it on Amazon here! 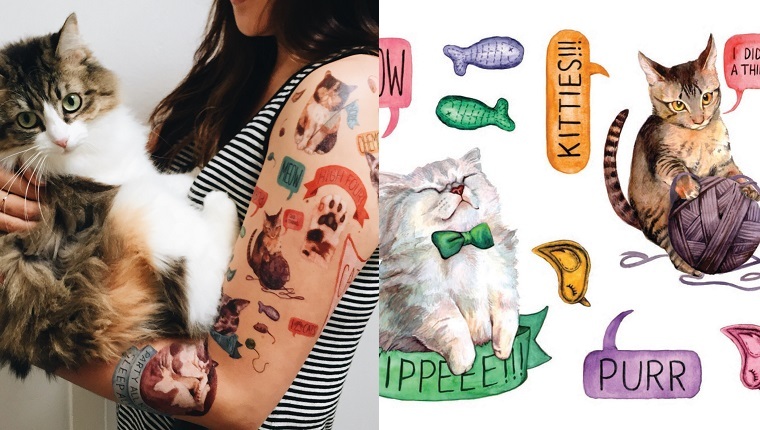 Finally, every party should involve temporary cat tattoos regardless of the specifics of the festive celebration. What warms the collective cockles more than a judgmental kitty paired with the mantra, “I Dislike Most Things?” Consider Megan Lyn Kott’s Cattoos! your ink-pushing friend. Buy them on Amazon here! What other not so sensible gifts would you get for a cat lover? Let us know in the comments below!